Before the Slicer Brothers (Number 48) reveals the person who hired them to guard the place, Lust and Envy appears and destroys them. Edward prepares for the fight, but the broken automail arm causes him knocked by Envy into an unconscious state. Lust and Envy discuss eradicating the building, but they still save Edward from the explosion. At the same time, 2nd Lieutenant Ross and Sergeant Brosh arrives to rescue the Elric brothers. After the incident, Edward needs to fix his broken arm again. Alphonse still thinking of what Barry the Chopper (Number 66) said to him when they were in the building. What if his personality and memory were artificially created by his brother? Winry, Edward's automail mechanic, needs to come to the Central to do the maintenance work. Winry is worried that her previous maintenance work causes Edward's injury, but Edward convinces her that the arm was working well although, without his knowledge, the automail arm was lacking one screw. After Winry fixed Edward's arm, she is looking for a place to stay. Without any chances to say anything, Lieutenant Colonel Maes Hughes drags her to stay at his house, and together they celebrate his three-year-old daughter's birthday with the family members. The Elric brothers has an argument when Alphonse questioning his own existence and the trust on Edward to restore his body. Alphonse suspects that Edward is hiding the truth of his existence. Winry is angry with Alphonse and reveals the secret that Edward has been feeling guilty and blaming himself every day, and determines to restore his brother's body as soon as possible. President King Bradley pays a visit to Edward who is still recovering in the hospital. Under the president's command, Lieutenant Colonel Hughes, Major Armstrong and the Elric brothers will be investigating on the people who are in the research list for the philosopher's stone. Before the group heads to Rush Valley, they will stop at Dublith to visit their sensei. Meanwhile, Lieutenant Colonel Hughes found some crucial information from the old records in the archives, but before he is able to inform the president and Roy Colonel Mustang, he is injured by Lust and threatened by someone who has strong impersonation skill. On the other hand, Scar seriously injured by Lust and Gluttony and escapes into the tunnel before losing consciousness. He awakes in a slum for Ishvalan refugees outside of East City, having been rescued from the sewer by some of the ghetto's inhabitants. 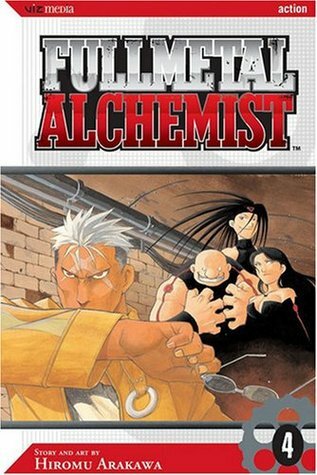 Previous volume: Fullmetal Alchemist Vol. 3 (Fullmetal Alchemist #3). More reviews can be found on Goodreads: Fullmetal Alchemist Vol. 4 (Fullmetal Alchemist #4).